The official unveiling of Emeritus Professor Mikko Ojala of the Department of Teacher Education at Helsinki University was on Tuesday May 8th, 2012. The modest but lively gathering included speeches, toasts and a jaunty procession to hang the painting in the department hallway. The best way to start a portrait of a veterinarian is to go to a cow barn, horse stable, zoo or small animal hospital to catch one at work (preferably without any blood/feces/indescribable substances spilled all over, though it depends on what sort of "mood" you want the portrait to evoke). I chose to capture the veterinarian Matti Heikkinen pausing in between procedures in a cow barn. Matti had graciously invited me along on one of his on-call days, and as luck would have it (for me, not the cow) I was able to observe a calving-with-some-complications case. I watched the procedures, took documentary photographs and generally stayed out of the way. Back in the studio I composed several compositions from this one event, including this standing portrait of Matti. Using a number of photographs as lighting and compositional references, I sketched the full figure in charcoal on canvas, not going into detail but mapping out the proportions and placement, so that alterations and corrections could be made in impermanent charcoal and not in bulky paint layers. The first layers of paint put to canvas were a loose ochre color for the background and a darker, somewhat green earthy tone for the body and clothes to sketch in the shapes. The composition now set in color, I focused on capturing the face, blocking in the shadows and then highlights in two separate sessions. Generally I don't work wet-on-wet, preferring to work new paint layers over previously dried layers, so as not to muddy the colors or make transparent washes opaque. Next I loosely sketched the arms in color and began to define the background shapes. I try to work the whole composition to the (almost) same level of completion before moving on. If one area is overworked then evaluating the overall effect and success of the painting becomes difficult. The following layers of paint were slowly added to build up the background and clothing. I worked from dark to light tones, to add a sense of depth like one sees on still, tree-shaded, pond. Even though I use a fairly quick-drying medium mixed in with my oil colors, I have to wait on average two days between paint layers. This makes the painting process seem to drag on for ages, but on the plus side I get time to scrutinize the painting and plan my next moves. Some shapes I took directly from the reference photographs, but mostly they are interpretations of photographic imperfections, light reflections, dust motes, blur or shadow or just fanciful creations powered by my (seeming) obsession with elliptical forms. The hues and tones in the face and hands are taken from what I observed while those in the environment are only loosely based on observation. (The vague yellowish-ness of the painting in these photographs is due to the incandescent lighting in my studio and iPhone camera). I never have a fully realized concept of the painting before I start it, so knowing when the painting will be finished is a bit difficult to anticipate. More often than not I gauge the painting's state of completion by how many weak areas I have to change or alter. If nothing jumps out at me to be adjusted, I leave the painting alone. A painting isn't finished in a flourish, the nitpicking is left off. Here is the final result. 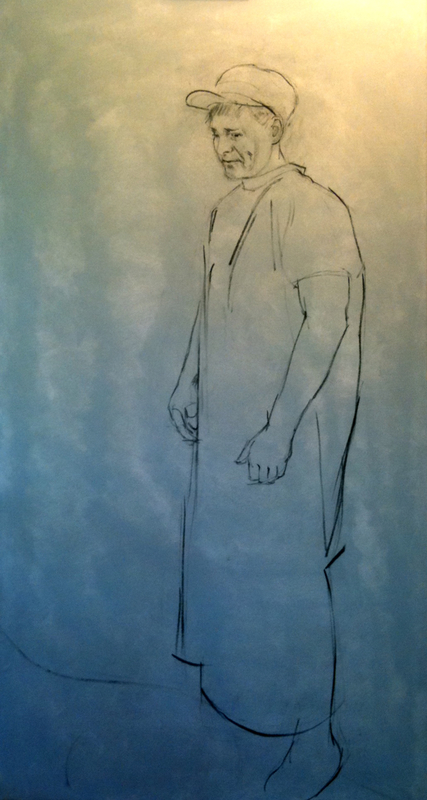 The Veterinarian, oil on stretched canvas, 128cm x 69cm, 2012. Friday September 16th, 2011, was a very exciting day for me. That afternoon was the reveal of Professor Rauli Svento's portrait, which was my very first commissioned official portrait. Or how I slipped up and described it to the Dean of the Business School as 'my first official commissioned portrait', which sounds like it was my very first commission, officially, ever. To makes things clear: it is an official, public portrait of Professor Rauli Svento, commissioned to celebrate his 60th birthday and his distinguished career at Oulu University (and he's not done yet!). It will hang in the Oulu Business School (Oulu University Linnanmaa campus, here is a link to the university posting about the event). Professor Rauli Svento has worn many hats during his career at Oulu University: researcher, professor, Dean of Economics and Business Administration and Vice-President of Oulu University. He played a central role in building the Business School program from the ground up and as a co-creator of the Matti Ahtisaari Institute. Professor Rauli Svento was a brilliant sitter to paint, and that superlative works in two ways: he has a very amiable and easygoing character that brought a calm focus to the painting process, and his intelligence and perceptive nature made for very interesting topics of conversation. It's not every day that I get the chance to pick the brain of a top-notch economist, what with all the global market explosions going on these days. The portrait was composed in shades of blue, blue being Professor Rauli Svento's suggestion and preference. I see it as a direct challenge to all those brown and muddy-grey toned portraits that can be found lurking the halls of universities and hospitals, remnants of a pseudo-cubism episode of portraiture here in Finland that just won't die. The portrait was completed over a course of six sittings in the spring of this year. I tried to keep the light consistent by scheduling each sitting for the same time in the mid-morning. The painting was started in semi-defuse sunlight conditions, so I was thrown off one morning, near the completion of the portrait, when the sun came out from behind the clouds and light popped through two windows at once. It was a surprise (I had forgotten how spring sunlight came in the room, due to the long, miserably dark winter) and I was excited to put down new colors and highlights, but I had to stop and control the impulse to capture that specific moment of light because it would have upset the balance of the composition. Plus, people would probably have wondered at the strange light situation and ignored the subject. Six sittings seemed like a lot of time (average 2-3 hours each) when I initially scheduled it, but it was just sufficient for painting the face. I used photographs taken at a few sessions (under different weather conditions) as references for modelling the suit, tie and backdrop in between sittings. As I couldn't step back from the portrait during the sittings (I still need a studio, surprise! ), I also referred to the photographs to correct any blunders in the drawing/likeness.